Whether it's your opener that won't function correctly, your door panels that got damaged by a car dented, or your springs that need to be replaced before they break, our team can help. We specialize in providing a fast and reliable repair service for any and all types of overhead door systems. A metal garage door will pick up dents more easily than you might think. Even the smallest dent can be unsightly, but large ones can actually hinder the performance of the door and negatively affect the quality of its security. Since we work with name brands like Amarr, Clopay and Windsor, we can find panels of a matching design and replace the damaged units for you without compromising the curb appeal of your door. That is, providing that the damage is too severe. If we can fill the crack or straight the dent we will do that on the spot. Without a smooth set of rollers, your garage door won’t be able to move properly along its tracks. If these components rust or become damaged, getting them replaced in a timely fashion is important, as otherwise your door will have issues moving, and may even not be able to do so. We can replace old worn out rollers with new nylon coated ones that won't even need to be lubricated, or sturdier ones that won't wear out as easily. The more complicated the device, the more issues it can develop, and by far the most complex part of your overhead door system is the opener. This unit can suffer from all manner of problems, from damaged and fried electrical wires to a faulty motor gear and misaligned safety sensors. Our technicians can identify and fix these issues, and if the unit is beyond repair we can supply you with a new one from one of the industry's leading manufacturers, such as Chamberlain, LiftMaster and Genie. Torsion or extension springs are used to carry your door’s weight and help it move using tension-based force. However, these components have a limited service life, and after they wear out long enough they will end up breaking. Replacing the springs as quickly as possible is therefore very important. It’s essential to have professionals do this type of work, as these components can be very dangerous if not properly handled. No matter what problem your overhead door system is experiencing, our technicians can find a solution. 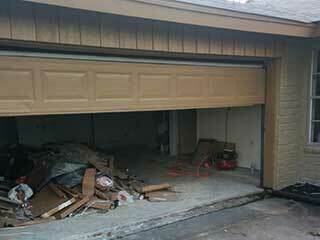 Call Garage Door Repair Coral Springs today to have our experts take care of things for you.